Bobber and shrimp, South Fork of the Nehalem. Please check here for the J and B Lures contest winner! Then go enter the next contest, thanks to Fabs. org! Fun! I love to give away stuff! More than that, I love to win stuff, and I never do! What is it like??? I fished the South Fork of the Nehalem yesterday. I caught a nice silver jack. Well, it wiggled!!! Released him, and then Bill ran into something on his Kwikfish. What was it? Who knows, never got it to the surface, but it was big! Fishing isn't only for catching fish. It is for catching glimpses of what others miss by only trying to beat you to the next hole. Next time someone picks up anchor when they see me coming, obviously trying to get to the next fishing opportunity, I'm just going to wait it out, happily, and catch what they didn't see by being in such a hurry. I don't mean fish, but then again, sometimes, this is when you catch fish too! It's a reward thing for being observant of all we have been given. Being thankful, being patient, being peaceful. The sky is pink cotton candy this morning. The fog lays low and it's trying to be a red sky in the morning-warning. Instead it just brings smiles to my face. It's pretty here... Time to go fishing.... or seeing. Hey! Check out this huge buck that Tony and his brother caught! Cool! Marie from Tillamook Bait has ifish decals, so if you are in town, stop by and pick some up! I drove Andrew to yet another pre surgery appointment in Portland. Oohs and aahs of delight came fourth every bend in the road. The trees shouted out colors from every corner. Some years my trips to Portland miss the exact timing of the trees turning to blazing colors. It's hard to do this year, with the leaves clinging, holding on for dear life, for what seems an eternity. For over a month now, they hang, wet, by an ever so delicate thread in the stillness of this stormless season. If you brush them, ever so slightly, they are persuaded to fall, to die, to signal winter has finally begun. The leaves are ever so resistant to give in this year. It scares me somehow. This whole stagnant fall season unsettles me. I heard on the radio the oldest woman in the world died prior to her 115th birthday. I don't know why it struck me so hard. David was talking to a mentor, discussing his disorganization problems. David is a brilliant student, and they are trying to figure out how to challenge him, while helping him with his "absent minded professor" problems. She asked him how he would rate his worry about his Mother's illness. He revealed to me his answer. He said, "I was not worried when I was younger. Then my cat died, and I worried more. Then Hershey died, and now I am worried." I don't know why this struck me so hard. I don't want my kids to worry about the leaves falling too soon. I bought an entertainment book for 2000 to support the schools here in Tillamook. While Andrew and I waited in the doctors office for x-ray results, the doctor came to us and asked to speak with me alone. More special circumstance to handle Andrews syndrome. Can't do the surgery here, have to go to Doernbechers due to his special needs. "We scared ya, didn't we doc?" Is all that I could say. Humor is always the way I deal with these things. Humor to hide the fear. I think back to my Mothers last night alive, and how my sisters broke into awkward hysteria and joking, trying to keep her comfortable. Sometimes the pain is so great, all you can do is laugh. I sat down with Andrew and told him that we get to go to the new hospital, where there are better facilities. We get special treatment, that's all. How much does this kid know? How much does he worry? Do leaves fall in the middle of summer? Does he think about that? Did he worry when I was pulled aside? We continued browsing through the entertainment book. "Hey, I don't see OHSU coupons anywhere in here", I told Andrew. "What a rip! Don't you think there should be at least one 'buy one get one free echocardiogram? One 'buy one get one free eye surgery?'" We drove home again through the wonderland of leaves that are still clinging to their branches. And Here's Jennie... with news you can't use! The Kilchis came up last night with the heavy (ha ha) .54 inches of rain we received. Let's see, the river is flowing about one inch higher than before! After a thorough check, I have decided that sure enough... There still aren't any fish up here! So, all waterfront property owners are called to action! We need water in the river! Will the combined efforts of all of our hoses turned on high and placed in the river bring those fish up? I doubt it. Save your resources. Last night I was in hope. Everyone kept muting the T.V. "Listen! I hear rain!" We would all sit silent and listen.... You'd think we were listening to Santa's reindeer. I went to an awesome Northwest Steelheaders meeting on Saturday and listened to Jim Greer of the ODFW. I was thoroughly impressed. Now I understand a little better about the budget woes. I think we are in good hands with Jim, and would like to thank him for all of the extra work he does, speaking and answering questions at events such as these. I have raffle tickets for sale for the NW Steelheaders and would like to offer them for sale here. The Grand prize is a 5 day-4 night stay at Yakutat Lodge including airfair. Several other nice goodies too, the winner to be announced at the Sportsman's Show on February 11th.. E mail me if you are interested. 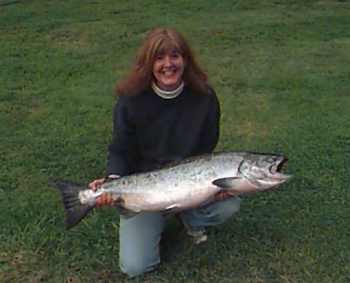 Soon I will have a page up with listed prizes, contest disclaimers, etc.. Support your Northwest Steelheaders! I am really pumped about getting a whole lot of people together on November 18th to plant fish cakes! We are planting fish carcasses, and the event should be a whole lot of fun! Plus, it will make you feel good about yourself! Visit ZaQ's page, thank him for the work he is doing, and sign up! Go ZaQ! So, on the bright side of no fish, I have conjured up this 'glass half full' list of benefits to low water. How bout some low water tech? 3. Approach cooking and love with wild abandon. Have a great day, and hey... maybe the hoses might work after all. Just posted some pictures, and some interesting facts about WHY we plant fish cakes.. Please read! Bill Monroe and his son are planning to join us on our volunteer day, Nov 18th! Wonder if it's raining.... nope! I am going to look into brands of life vests and do a little informative article on them soon.... Stay tuned. Thanks to Bev and others who have pointed out brands they have and enjoy. Gives me a place to start! The North Coast Salmon Rendezvous is in the air, and all people can do it wonder.... Where am I going to catch the most? Wheeeee~! I love this time of year! Ask questions, get answers live on your favorite fishing issues. I always get lots of info as well as giggles out of it, and last week, some mystery guy signed on as Brenda. I, of course felt an instant bond with this she-type, only to find out later who dunnit. No fair. Please, tonight, women.... join us! I need some more fishin females on the chat! Come on, Bev, Dot.... be there! .72 inches of rain since 6:00 last night, and the river is still holding at low. I'll go check the other rivers, but The Kilchis is sure not reacting. Where does it go? My Mother used to have what she called 'tornados' in my room. Now my boys have them too. It's tradition. I simply pick up everything in site that is out of place and it goes in one big pile in the middle. "Boys?" I greet them kindly. "There has been a tornado in your room." The not completed results of the Salmon Rendezvous clearly shows that not many fish are in the area. With the best of the guides coming in with very few fish, it doesn't give me a whole lot of hope. But yet I will still try! We am going to float the Kilchis from the logging bridge down and see what we can find. It is so cold out! The winter birds are showing up, and it is so nice to see them! My juncos! My thrush! Flickers, towhees... Welcome! Fished out back yesterday and had a bobber down.... and then back up again. Oh well, someday....! I tried everything, so I thought I would try Andrew. Sure enough, that is the trick! I am now going to rent Andrew out to all of you anglers that need fish in their boats. This kid has unbelievable luck! I don't know what it is! Maybe it is that he does not care that much, he's relaxed, he's enjoying the river and BAMMO! Fish on! Andrew... One chum, one fine, 24 Lb. bright chinook. Andrew caught his Chinook on the Kilchis with a sardine wrapped, Red Dog labeled, K14 Kwikfish. We floated the river, and he was awesomely impressed for the first 15 minutes of bright sunlight and pretty scenery. Second hole, he hooked his first fish. By the third hole he was asking what time it was and when we'd be back. It was before noon. He had his Chinook! I had a great time with The North Coast Rendezvous people this weekend. Rod Brobeck is an amazing guy, putting together all of the details. I don't know how he does it all, except for with the help of Sharon, who is fun, and very detail oriented! I received a very snazzy shirt for volunteering on Saturday. Now I feel I belong! Bill helped set up the auction, and I set up the sign for all of the supporters in alphabetical order. I never said my ABC's so many times in my life! Thank you to all of the businesses that donate to such a great cause! Thank you also to the guides who gave up their time to support The Oregon Wildlife Heritage Foundation. The food was wonderful, the people and guides fun to visit with! The highlight of my weekend was listening to Rick Klump speak at the Awards Banquet. Rick shared with us how many phone call requests he gets daily to STOP fishing and to close our hatcheries! I would like to impress upon you how important it is for all of us to stand up for our hatcheries and fishing. Write letters, people. Make phone calls. Our voice needs to be heard more strongly than the opposition. I think Rick would appreciate a few phone calls of support. Mr. Klump spoke about the poor return of Chinook this year and the impact the '96 floods (Remember, there was another bad one in the Fall of '96) have had on our returning 4 to 5 year olds. He impressed that fortunately the runs are resilient, and that the 3 year old population is strong. Consequently, the next two years should be really good. The Canadian treaty should create a 20% increase in our Chinook catch next year alone. Improvement in ocean conditions has greatly benefited all species of salmonids. He also stated that next year we will have more Coho salmon than we know what to do with. I know what to do with them, don't you? :) I think we need to let people know. Let's start writing some letters, boys and girls. Start with the addresses I have listed here. See R.T.s post on the Discussion board about the the proposed .05 allocation of next spring's 300,000+ Columbia River Spring Chinook Salmon run. R.T. writes..."As it stands now the sportfishers and non-Indian gillnetters combined would get a paltry 0.5% ESA impact allocation! ...Good numbers of letters mean something to our Congressmen. Great numbers of letters move them to action on our behalf!" Please write, people.... and while you are at it, volunteer for the Fish carcass day on November 18th. Why? Read here! Write a couple more letters about our hatcheries, especially the North Fork Nehalem hatchery. When I started fishing, I thought... "Whee! This is fun!" Not a care in my fishing life! Now I am moved to action. Danger looms on the horizon if we don't do something now! There were a total of 6 fish caught on day one, and another 14 fish on day two. That sounds pitiful, knowing that most years these results are at least tripled. We can't stop flooding, but we can start writing our Government to assure our fisheries stay open and fair, and that we are allotted the fish we pay for as taxpayers. Believe me, if you just stand there with a rod in your hand, do nothing but buy your license and expect to catch fish, you are in for a big surprise. If you want to feel action on that new G Loomis you bought, you need to take action! This means you need to take the time out today, while the rivers are low and clear! Write to your Government to help assure that when the rivers come up, you will know that you have done your job to keep our fisheries open. I, for one, want my son, (as pictured below) to have a picture of his son with a nice fish like this one! I thank you God for this most amazing day: for leaping greenly spirits of trees and a blue true dream of sky, and for everything which is natural which is infinite which is yes. O.K., I'm mushy/gushy... But what else could come to me as my eyes search out into the frozen sky this morning? I am thankful! The meadow that stretches out before me is icy white. It stops abruptly and sharply rises to the hills that make up the canyon around me. I feel small and insignificant. The tall trees, painted in winter colors tower over me. They reduce me to scale with the birds that eagerly seek out the seeds that Bill and I sprinkle about the lawn every morning. The underbrush that separates the meadows from the hills are alive with movement. Groups of juncos, towhees, song sparrows, thrush and chipmunks dance around in this area, gathering courage to dart out far enough to get to the offerings we have left them. We could throw the seed into the brush, we really should, to ensure their safety. But we want to see them! The bold blue jays seem to signal when it is safe to come out. They are the first to show the way, and the first to signal danger for the smaller birds. If you can find good in blue jays... you can find good in anything! The sky is the palest shade of blue. It shows me that I will have a day today in which I can prepare for winter. Maybe bake some cookies or candy to store in the freezer for the holidays... Maybe get out my steelhead rods and polish my G. Loomis that I haven't seen since early spring. Maybe I'll work in the yard. The sky is the palest shade of blue. There is no rain in the forecast. My first thought as the sun rose over the hill was of disgust. I want rain more than anything! Rain and fish, and fish and rain! Looking closer at all that is around me, I realize is it not what I chose, but a gift I have been given. I am humbled. When the fishing gets tough, the tough get fishing. It's a pathological gamble. They refuse to give up, and yes, it pays off! There are fish in that river, you just have to work for them! Low clear water conditions have everyone on edge. It is a piscatorial kind of mania. The discussion board is filling with silly posts from those who know there are few fish, but yet refuse to give up talking about fishing. These are genuine salmonid addicts that can't think of anything but fish, and need a fix! Some show a little exhibitionism by posting their biggest catches. For some, this is a time to reflect. A time to remember fishing buddies that may no longer be with us. We think back and smile. We have good days and bad days. We see the weather forecast that promises long stretches of sunshine. We work and play next to people who think this is lovely weather, and we try and catch their happy bug. Sometimes it works. Sometimes it doesn't. We find ourselves feeling crabby and hopeless. Then there are the tough, those that I spoke of above. No matter what, they are on the river. They study the river bottom, they see fish and do anything to get them on line. It is not a delusional disorder! They travel home, in a warm pickup truck after dark, with their cooler full of fish. There are fish in them 'thar waters! Jim Erickson tells me the ghost hole has been producing a few fish for those of you T Bay fans. Very light pressure with a medium good bite at high tide in the afternoon. Remember, the ocean outside of the bay is now closed. Targeting chums is also closed as of Nov. 15th. The Chinook have been holding back, waiting like we have, for the rain. Milling around the bay, they are now getting cranky, and feel pressed to spawn. With their ears pinned back, they enter the rivers. Slowly, they fill the deep pools in tidewater, shooting up, hole by hole, by the dark of night. They are genetically programmed to do this, just as we seem genetically programmed to go after them. Every day as I go to town, I have a ritual at one of the bridges over the Kilchis. I stare into those cool waters and watch the chum salmon. I can gaze at them for hours, stacked in deep pools in numbers greater than fifty sometimes! With the bright sunlight on the clear waters, it is a great study to watch their behavior. I become trance like, and often late to appointments with this obsessive compulsive disorder! I just can't stop! Tomorrow I am going to sling salmon carcasses. It will give me something to talk about. It will provide me a connection to what I love, by getting me together with some other hypomanic anglers. There is nothing like being on the river at first light, with rod in hand, or not. I need the fix. Five in the morning, 26 degrees out. Fish Carcass Day! Thanks to the combined efforts of John Casteel, Michelle Long, ZaQ, and the Ifish group, we are going fish slinging! I can't wait! Yesterday I built my column around a list of mental disorders I read on a web page! It really does strike me sometimes, that there may be something wrong with me. I think-breathe-dream-live-wish everything fish. I got the coolest 'stealth bobber' from Dennis at Tillamook Bait! It is hand carved out of wood! Beautiful! Get one! Ever try to go to sleep after you have stared at a bobber all day long, bobbing slightly with the movement in the water? It becomes burnt into the recesses of your mind. When you close your eyes it is all you can see. You finally fall into a deep sleep and it is not until then that your bobber goes down? Breathless and shocked, you bolt upright in the night, searching for the rod to set the hook. All love songs that tumble through my head come out of my mouth replacing the key words with angling words. I love R.T.s latest, "Chum chumminy, chum chuminy, chum chum, charoo! You catch you one chum and I'll catch me two!" I don't know.... but I am content being fish sick at heart. This is why I am going fish slinging with the carcass project. As we come to the holiday season, I have been browsing through tackle catalogues. What will Santa bring me? I Wish you a Merry Fishmas, and a Lotta New Gear! I have the blues. So do the skies. Oh sure, it is cloudy out, but where are the Oregon rains that I crave? I have had a rough day. I'm tired. Went through a bit of a shock when I slid in the ice with Bill's Jeep this morning. Scared me enough to turn me around from where I was headed, (I was already half way turned around...) and go back home. This was after I didn't sleep well, woke for my coffee, went to check the internet and received a shocker! Ifish was down. O.K., that's no big, I can fix that, but all the forums on the discussion board were gone, and I couldn't even get into the control panel! All the pages I tried to get to said, "FORBIDDEN You don't have permission to access these files." WHAAA? Anyway, we'd been hacked. I was freaked! Hacked? Ifish? Why? I simply had to leave it! I had to get dressed and leave for Astoria! So, with ice on the roads I headed out. Not good. You know that story. So I headed home feeling rather defeated and on edge about the site. Things worked out. We are back up. But.... I don't know, still feel blue. Maybe it is because there is a Chinook that lives out back. I have been watching him/her today. I have tried every tactic I can find to get this fish to bite! I even dressed in camouflage and crawled to the hole on my belly! I cast out a spinner and retrieved it laying on my side! I am getting fed up with these low clear waters. I need a fix. I need it bad. Next thing I am going to do is buy a salmon at Safeway, hook it on my hook and throw it out into the Kilchis. I will drag it through the riffles, letting the water pull and play against me. I'll run up and down the bank screaming "FISH ON!!!!!" and "Wheeeee! and ARGH!" I'll jump over downed alders, tripping on rocks, falling face first into the gravel. I'll still have that fish on though! (Pant pant...) Then I will reel it in and net him. I will totally defy reality and mark it on my tag. I'm just about there. On a stretch of 1100 feet of riverfront in November on the Kilchis there is one lonely chum. Bill saw it yesterday. I didn't go out to look at it, I didn't need to. The picture of one lonely chum in the low, summerlike conditions on the river is clear in my head. I feel sorry for this salmon. What must it think? Where might it hide? The urge to spawn is strong, and they have to do it in plain site of everyone? Dang! Cover those fish up! This is private business! This is the second dryest November in history. Despite this years drought, I know of plenty of persistent types who have more smoked salmon in the fridge that they know what to do with. How do they do it? They fish anyway! They go out, despite the reports, and catch fish! They go home afterwards, in a warm pickup truck with a satisfied smile on their face and a fish in their box. They give thanks to the Salmon God in the sky. The tidewater of the Tillamook rivers hold quite a few fish right now. I have seen them. Glass bottom boats are not even needed, although I have dreamt about it more than once. I almost have more fun looking for them just for the show than trying to get them to bite. (Then I remember, this is private, and I turn my head... NOT!) If you position your bow to go through the deep pockets, and look to the shallows on the opposite side, you see whole schools of them flashing by in madness. "There they go!" Someone will shout, and all eyes are riveted on the 'shooting stars' salmon parade. They are there, can you get them to bite? This is the ifish challenge. I want to wish everyone that makes this site what it is, a very happy Thanksgiving. There is so much to be thankful for. I hope you never forget that. I hope you tell people you love, that you thank your Creator for them everyday. And then, don't forget to do it! Then someone pops out of the woodwork, like Pete, and reminds me of all I have to be thankful for. Thank you, God.... for Stan! It's raining! .62 since last night! WHEEEEEEEE! We have become so accustomed to waking to bright winter mornings. Ice, glistening on the lawn, that doesn't melt for days. The sun rises late, and falls over the hills slightly past two in the afternoon. It leaves us in the shadow of winter before the day should be done. As we arose from our long winters nap, a different light was cast on the sky. No need to steady ones self on the frozen steps while making our way to feed the birds that live on The Kilchis River. As we made our way through the dark house, the sky was heavy with billows of fog. They moved like mountains across the canyon walls. The leaves are still hanging unseasonably to the trees. Wet, heavy, fall leaves that have long expired their use, and are still waiting to die. They stretch toward the ground, seeking a gust of wind that will bring them full circle. We turned all lights off in the kitchen and sat with our morning coffee. Me, with my eyes in my hand, (the binoculars, a necessary extension), and Bill, who magically sees all, even in the bleak winter light. Yesterday we attempted to force the season by making suet in the kitchen. Winter has to arrive sometime. Our hands mixed the bacon grease and seeds together. We worked steadily as we listened to a pack of coyotes howling across the river. Magically, the birds woke this morning and came to feast, obviously aware of the Thanksgiving holiday. Birds like I haven't seen all winter! Towhees, Juncos, Varied Thrush, Stellar Jays, Chickadees, Song Sparrows, Red-breasted Sapsuckers, all thickly scattered about at the feasting table. We sat quietly in the dark, in awe of all the creatures in the woods. This is what 'awesome' is, not the teenage equivalent! Our silence was interrupted by sudden intakes of breath "Oh! A chickadee!" Or...'Here comes the chipmunk!" It is Thanksgiving. We have rain. We have birds. The season, the holiday... it happened all at once, this morning. Tomorrow morning it will happen all at once again, the dash upriver of the mighty chinook. I won't be sitting at my table. So, in the spirit of the holidays, sick or not, a bit restless from laying in bed, I created this! 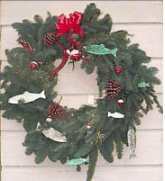 A fishmas wreath! I took bobbers of all sizes, dipped them in glue and glittered them in the appropriate colors. Then I cut out fish in this foamy material, dipped them in glue and glittered them up too! I attached them all with swivels onto the branches and wallah! Swivels really are a girls best friend. I have repaired more jewelry with swivels. Who can tell? I always have had a love-hate relationship with glitter. It is now everywhere in the house, despite numerous vacuum jobs. But it is so darned pretty! My couch just glistens! Now I have this weird craving to dip all of my bobbers, even the real fishing ones in glitter! There is nothing a girl likes better than pretty fishing! Can you imagine a glittered bobber in the bright winter sun? Off to Astoria I go.... Sick and all. I can't really justify fishing this afternoon if I miss church. Sometimes I just want to commit webicide. I woke yesterday to the frightening, unsettling task of trying to find out WHY ifish was down. I tore out my hair a bit, made a few phone calls, and then.... what could I do? It is very unlike me to play when my web site is down. It wasn't easy for me, but I just had to look at what was important in life. It looked as if we had a window of opportunity on the coastal rivers. Despite stormy conditions on the web, we had a lovely day, in between weather fronts. The water was that beautiful milky green, and a drift boat was handy. What does that add up to? We worked the Kilchis with everything we had, missing a couple take downs, and seeing the first steelhead on Bill's line take one beautiful flashing leap out of the water, thus disengaging the hook. It was a pleasure to see chum salmon, lined up in the shallows, spawning, just as they should be. A healthier run? It appears so! I got busy on the phone again. I added my worth of worry and despair. I pushed some buttons. Ifish was gaining a bit of life again. Time for a break, I thought, and grabbed my bobber rod. What a nice slow drift it was! What a nice fish I caught! Yay! A nice 34 Lb hen, all by myself! I was so thrilled, and so full of adrenaline over this fish! I will be out there again at the crack of dawn! I've got the bug now! Funny, the dialogue that proceeded this catch. "The minute you get out of the boat, we'll get into fish", they boasted. I told the guys that I would go home, light a fire in the wood stove and then catch my fish. By golly, I did. They were off to the Wilson, with their power boats and expensive rods... You know, the spoiled 'boat boy' technique! The bank loves me. I love the bank. I catcha da fishes. All you need is a paper clip and a worm. Anyway.... Please, let's get together and chat about the dash upriver of the Chinook, and the arrival of the almighty steelhead, tonight at 8. Host Marty Peterson, of Gone Fishin Guide Service is a great source of knowledge, and an all around great guy. Give him a thumbs up when you see him on the river, and hey, while you are at it, book a trip with Marty! Bill and I want to go with him on the Nestucca! He is an impressive oarsmen and I want to do a little white water fun! O.K., O.K., I do like boats! Ifish appears to be running smoothly now. It is edging toward light, and I have a rod to rig up. Happy fishing, folks, next weather system to arrive tonight, with high winds and stormy conditions.... Fish now. You can hear them while you lay in bed at night. The sounds of whoosh, whoosh whoosh. They are singing to the tunes of The Wizard of Oz', "Follow the Yellow Brick Road".... But the words are much different. "Follow the white water trail..."
They break your sleep as you listen to their travels. Chinook, Steelhead, even their little cousin Cutthroat. Up, up, up river they go. From the ocean they come, moving through the frog waters in the tide affected areas. Up the river, where the white water attempts to force them back. Up to where the river juts into the mountainsides, the river cutting deep into the rocks. How can I sleep? The noise they create in my mind is so deafening that I lie awake, visions of sugar plums, I mean Chinook runs dancing in my head. 'Twas the night before fishing, and all through the night, all the creatures were racing up river with might....When all of a sudden I woke with a jolt! A silvery flash much larger than a smolt! My bobber goes under, the one with the glitter, then clear cross the river it skips and it skitters. I pull back with drama, I feel the resistance, but as I keep pulling I can't lessen the distance. I reel as I'm screaming, my face is just beaming. I wake up and wonder why Bills saying I'm dreaming. "Get the net out!" I scream, as he is shaking his head..
"The girls lost her marbles." He rolls over in bed. On a more serious note, I have to tell you the neat o thing we did with the birds that feed in the yard. We have too many jays.... So! We built a wire mesh box out of fencing. It is 4' cube out in the feeding area. It allows the smaller birds to get in and out of this protected area, where we heavily feed. The jays, excluded, are so frustrated! The chipmunks, Towhees, Song Sparrows and Juncos are thrilled! It works! Try it!